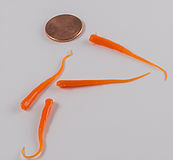 The B-Y BAITS WaterBug is one of our first and most successful baits. Time and time again it has proven itself, in many different situations, to effectively entice fish to bite. This is our "go-to" search lure when trying to locate fish due to its uncanny ability to call fish from a distance. Often times, when located, the B-Y BAITS WaterBug is all that is needed to start bringing those fish topside! The swimming tail action of the B-Y Baits Bloodworm has proven deadly even when all other baits have failed. The B-Y BAITS MudBug was designed to effectively immitate the tiny larvae that hatch out of the vast mud-flats present in most lakes and rivers. This bait works best bounced off the bottom to stir up sediment, just like actual larvae do when hatching out the mud. 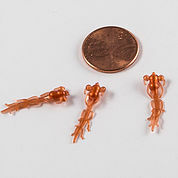 It's life-like action.n and appearance make the B-Y Baits MudBug irresistable to any fish species! The swimming tail action of the B-Y BAITS BloodWorm has proven deadly even when all other baits have failed! The B-Y BAITS MudBug was designed to effectively immitate the tiny larvae that hatch out of the vast mud-flats present in most lakes and rivers. This bait works best bounced off the bottom to stir up sediment, just like actual larvae do when hatching out the mud. It's life-like action and appearance make the B-Y Baits MudBug irresistable to any fish species! The B-Y BAITS SuperMinnow is perfect for those days when the fishing if fast and furious and you want a bait that will focus on catching the larger fish. By up-sizing to a bigger plastic, you can quickly attract the big fish your are after, with messing around with all the small ones that are ready to scoop up the first thing in sight. The B-Y Baits SuperMinnow immitates a meal fit for that wall hanger you have been pursuing all season long!ction of the B-Y BAITS BloodWorm has proven deadly even when all other baits have failed! The B-Y BAITS BloodWorm is an offering for those pesky fish who have turned down everything else in your arsenal. 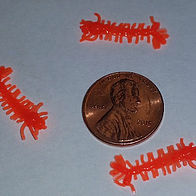 Often times all it takes is a smaller, simpler plastic to make them bite. The swimming tail action of the B-Y BAITS BloodWorm has proven deadly even when all other baits have failed! The swimming tail action of the B-Y BAITS BloodWorm has proven deadly even when all other baits have failed! How to choose which style? The B-Y BAITS Mosqito Larve was created to match the profile of the most common bugs found in the waters all across the ice belt. 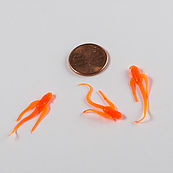 This is our smallest, most detailed profile that is designed to fool picky panfish into biting. Fish are denetically programmed to eat these little critters and that means more fish on the end of your line!e swimming tail action of the B-Y BAITS BloodWorm has proven deadly even when all other baits have failed! The B-Y BAITS BoatmanBug is designed to mimic the oar-like wimming motion the Water Boatman. By fishing this bait ina vertical presentation, you can imitate its trips to the surface to breathe when they are most vulnerable to predation. With over 500 species worldwide. The BoatmanBug is a popular forage in many ponds, lakes and other slow moving bodies of water. The B-Y BoatmanBug is another great profile to help you "match the hatch, and fool those fish. The B-Y BAITS MayFly immitates one of the most abundant insect larvae found in our home state of Wisconsin. This bait is specifically designed for those picky fish residing in waters with above average water clarity. 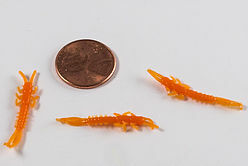 I challenge you to find a more realistic looking soft-plastic than the B-Y Baits MayFly!wimming tail action of the B-Y BAITS BloodWorm has proven deadly even when all other baits have failed! With so many different styles of B-Y Baits to choose from, how do you choose which one to use? The style of bait used is determined by how aggressive the fish are that day. Once you find a color that seems to peak their interest. You can fine tune your presentation by using the style that best matches the mood of the fish. 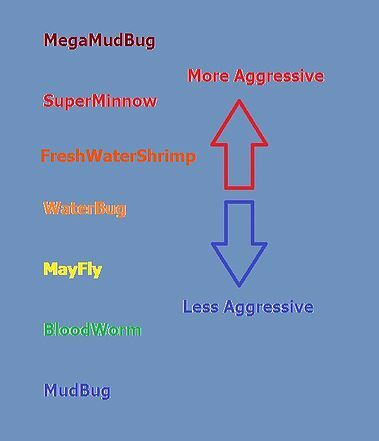 For example, if the fish are extremely aggressive you will want to use a big, "loud" bait to help keep the small ones away. 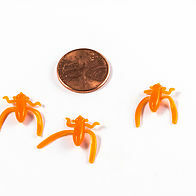 Where on tough bites you will want to use something smaller that can trigger fincky bites. The chart above is a good reference to start with. Swimming tail action of the B-Y Baits Bloodworm has proven dealy even when all baits have failed.e swimming tail action of the B-Y BAITS BloodWorm has proven deadly even when all other baits have failed!